44 - $107.99 Only 3 left! Ever watch an old cop movie or TV show where a witness specifically notes that a guy wasn’t wearing a coat and tie? Not so long ago, that was enough of an oddity to not just merit a comment, but to make you an official suspicious character. After all, back then everybody dressed to the nines, from business executives to mobsters to grocery clerks. What kind of weirdo would dare leave the house without a coat and tie? You might as well be strolling down the sidewalk without pants. These days, of course, if you show up at an informal event wearing a coat and tie, people are more likely to ask you what the special occasion is. But even though we’re now living in the era of t-shirts and cargo shorts, there are still plenty of folks who appreciate the classic style of menswear. Jazz musicians, for one. Also blues musicians. And guys in ska bands. And swing bands. And ‘80s synth-rock bands. Huh, maybe it’s mostly a music thing. Do fictional private eyes count? 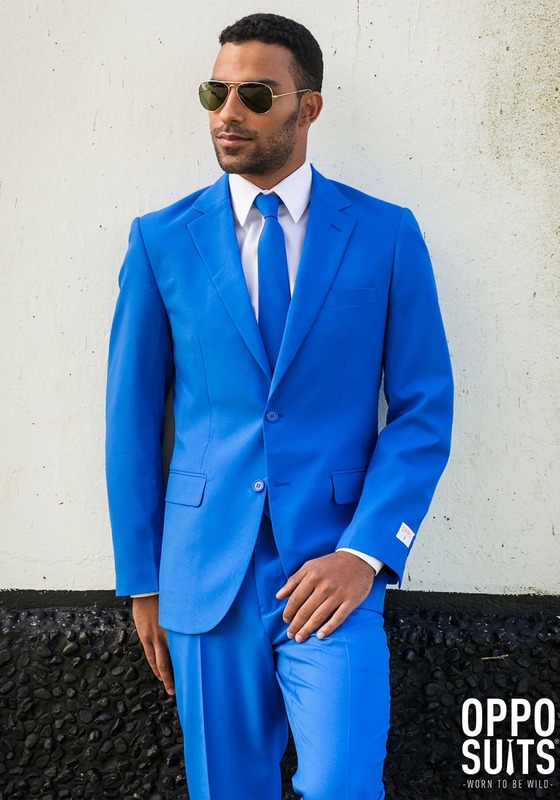 Whether you’re an aspiring musician or just an appreciator of the flashy fashions of days gone by, you’ll look your dapper best in this eye-catching blue polyester, slim-fit suit. 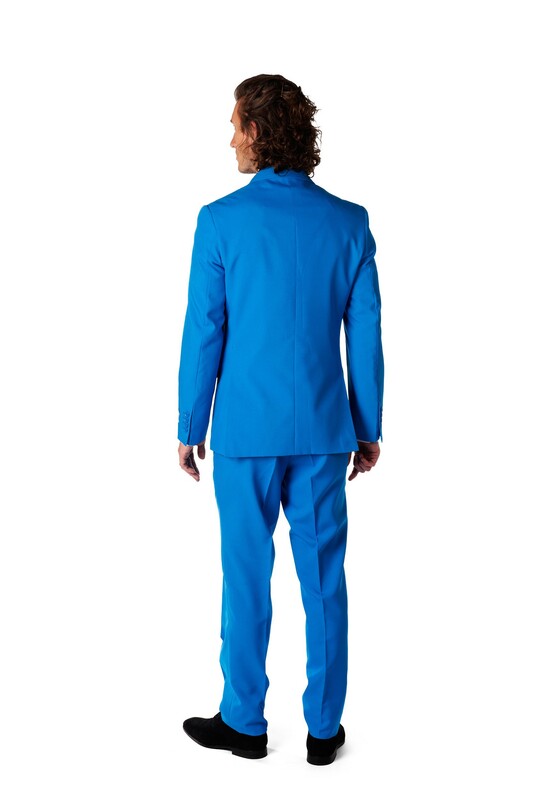 The ensemble includes a two-button, fully lined jacket, long-cut trousers with front and back pockets, and a matching tie - a real one, not a clip-on, as befits a classy gentleman. 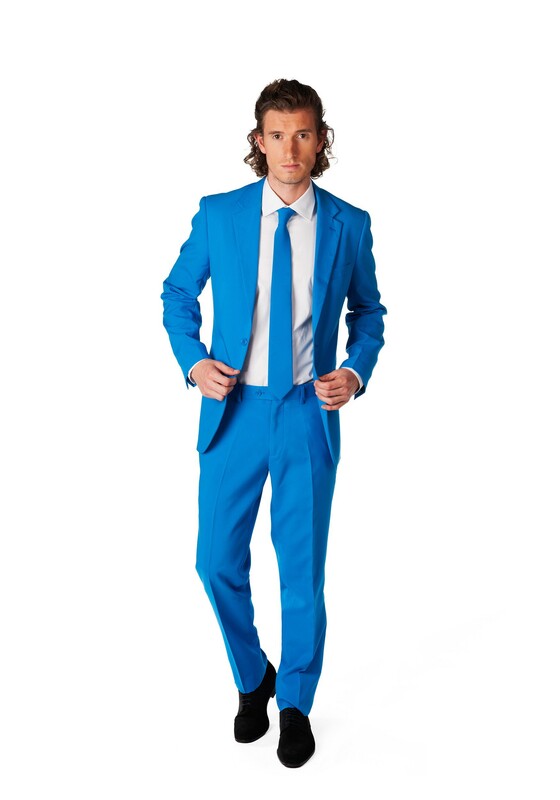 It’s a bright, bold look that puts you right at home in the 1940s, the 1980s, or just about anywhere in between.